Clocks do not reveal time, they conceal it. Checking the clock does not put us into time, but takes us out of it. We obsessively look at our clocks, watch our watches, glance at our cell phones for fear of losing time, but by that very act of finding, time is precisely lost. Knowing "the time" is not knowing a presence, but an absence. The clock is the veil of Time. 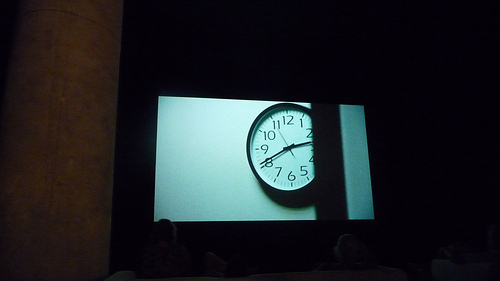 As it were, Christian Marclay's "The Clock" is not a film about clocks. It is about Time, but it is also about space, experience, continuity, fragmentation, memory, meaning, and, ultimately, a masterpiece memento mori that puts us face to face with our own finitude, our own death, and, consequently, our own life. The idea for the film is deceptively simple: for each minute of the 24-hour day, Marclay has found a corresponding scene from film or television where an image of a clock appears or a reference to that exact minute is made. At 12:04, a BBC announcer crams to announce the headlines before the minute is up, cut to an alarm clock that reads 12:05 where a young Richard Gere takes a bump of cocaine while getting ready to leave for some unknown place that requires him to wear a suit, cut to a dapper man in a bowler exiting a building, checking his watch, then discovering a dead homeless man behind a trash can. A minute has passed. At 4:32, Mathew Broderick timidly calls some “Linda” while he nurses a black eye with a cold bottle of champagne. He hangs up the phone, cut to a two men eating dinner with two young girls, cut to the reflection of a clock, 4:33, in a salon. Another minute. At the noon hour, scenes of lunch. As the afternoon develops, the alcohol appears. After midnight, loneliness and fear. At each quarter hour and half hour, the drama builds. At each hour, it seems like the world is about to explode: someone is late, someone is absent, a lover appears, a bomb detonates, a catastrophe diffused. The real “subject” of the film is life and death itself, not life and death in the abstract, or the life and death of the actors on the screen, but our own being, our own time. Despite this heavy matter, Marclay manages to conjure levity, humor, and playfulness—otherwise the film would be unbearable. Something haunting becomes hilarious through juxtaposition: in the final scene of Seven, the sadistic murderer (Kevin Spacey) asks the detective (Morgan Freeman) what time it is, to which he replies, “7:01,” the scheduled time of delivery of a package containing the severed head of the wife of the other detective (Brad Pitt). The audience bursts into laughter at this grisly moment because just before a scene from Bruce Almighty has Jim Carrey asking God (also played by Morgan Freeman) what time it is to which God answers, “7:00.” The simple fact that the same actor tells the time at each minute creates continuity between two discontinuous moments and places, thus making explicit the thin line between comedy and tragedy, laughter and tears, life and death. We laugh all the harder because it is a necessary cathartic release of the anxiety and tension that has been built as we voluntarily watch time’s trudge, reminded at every moment that a minute has passed, that we are one second closer to our death. Yet somehow, we cannot look away from "The Clock." For the first time, we truly watch the watch as it ticks, tocks, ticks…but what is it that we watch? Realizing such an idea is a Heraclean task that is in itself amazing. 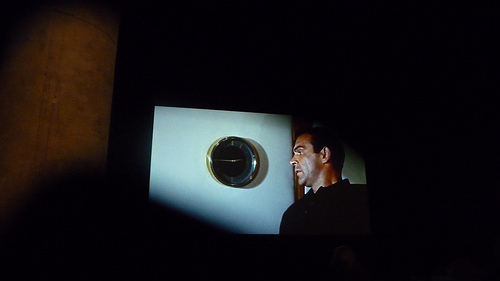 But if the film where simply a mash up of these celluloid moments, it would remain merely a fascinating gimmick. Marclay's genius becomes evident as he threads the fragments of film not only with the image of the clock, but through sequences that are connected by action, dialogue, and sound. A door in a mansion in a scene from a 1940s melodrama opens into a small New York apartment in the 1970s. A phone is answered by a gangster in Chicago, on the other end, a teenager secretly calls her boyfriend from the suburbs. A mention of "man in the middle of the field" is made during conversation, cut to a quarterback dropping back for a pass in the middle of a field. Not only the visual continuity, but the aural continuity. Marclay, a d.j., was just as meticulous with the soundtrack as with the image. Often, the sound from the past frame continues into the present frame, connecting not only two images, but two spaces and times. Marclay would even record new sound over an original soundtrack that he did not like, inserting effects and music to keep the ear interested. The proximate cuts are circumscribed by images connected by their distance—what seems at the moment to be an odd image of people standing in line at 6:10 appears again at 6:24. Suddenly, like a Becket play or a Kafka story, the viewer is in the queue, experiencing the mundanity and absurdity of the wait. The technical execution of the film is flabbergasting, but this is not what makes "The Clock" a work of art. The deft manipulation of a medium is what modern art critic Clement Greenberg called "Alexandrianism," a skill indeed, but not really the production of anything provocative or new, not art. What makes "The Clock" a work of art (one of the most important of the 21st Century) is that it is not something merely aesthetically satisfying, but philosophically provocative. Arthur Danto thinks that contemporary art, what he calls "art after the end of art," must be approached not simply aesthetically, but philosophically. "The end of art consists in the coming to awareness of the true philosophical nature of art." The “philosophical nature of art” is the movement where art does not only come to question itself as an object, which is the hallmark of modernism, but as a subject, taking a Kantian "self-critical" turn that tries to understand the conditions of its own possibility. Art asks itself: What am I? How did I come to be? Where am I going? Where should I go? Where will I go? "The Clock" becomes itself a clock, interrogating what it is to be "clock." In this way, "The Clock" becomes self-conscious, a subject, and forces the viewer to interrogate themselves not only as subjects watching "the clock," but as objects being watched by "The Clock." We must then ask ourselves the same philosophical questions: What am I? How did I come to be? Where am I going? Where should I go? Where will I go? The clock is one of the most interesting human tools. Like all tools, it operates dialectically, not only as an object used by a subject to alter the object that is the world, but something that becomes itself a subject that transforms the very subject (turning him into part object) that wields the tool. The clock is a way of measuring time, but it also changes the way we experience time itself, the way we experience our own selves. Think of how our smart phones have so rapidly altered the way we have our time, our space, our relation to others, our relation to our own selves. The tool is never merely a passive object—it works on its holder just as much as the holder works on it. Most all the images in Marclay's masterpiece are of classical clocks, pendulums, watches, digital alarms. Though the watch has returned moreso as a fashionable and luxurious item of conspicuous consumption rather than as a functional tool, our primary mechanism of checking the time is now via our cellphones. But these are not simply devices that locate us temporally, but spatially, socially. Cellphones are not passive instruments, but active technologies that shape our relation to time, space, and our fellow humans. As we read in a recent New York Times article, they are perhaps better understood not as phones, but as trackers, watchers, aware of where we are at every moment, tapped into our reservoir of desires at every second. Like Feurbach’s anthropomorphic understanding of God as simply a human projection of human desires that has become wholly other, with the cell phone “Watcher,” the same reification and deification of time and space is now complete—we no longer simply watch time and space, but time and space watches us. The mechanical clock only emerges in the 13th Century, an important moment because it marks a move away from the continuous measurements of sun, water, and fire to a discontinuous measurement marked by a pulse (though the use of the term “pulse” betrays an implicit connection to the body—with each beat of the second hand, the beat of a human heart). "Clock" comes from the Celtic clocca and slogan, both meaning "bell." With the mechanical clock that tolls, the measurement of time begins to lose its connections to the body as it is in the world and becomes something external, outside, a subject that speaks, announcing itself regularly, telling us that time has passed, that we are mere objects inevitably moving one step closer to death. I think of the great astronomical clock in Prague that begins (or ends) each hour with death ringing a bell. The saints make their parade, the trumpeter plays his tune, the crowd below applauds, celebrating time, rooting life, jeering death. But time can never wholly escape its connections to space no matter how much our tools try to objectify it. It is no surprise that two of the greatest astronomists, Galileo and Christian Huygens, also built clocks, Huygens credited as being the inventor of the pendulum clock. The interrogation of space is necessarily tied to an inquiry into time, and embedded in the parallel developments of the telescope and the clock is an anticipation of Einstein's discovery of the space-time continuum. “The Clock” takes us on a journey of time and place, but because the clock constantly reminds us of our own "now," there is a sense that the images are in fact pictures of a possible world that is occurring not elsewhere, but here, not at another time, but now. The viewer is somehow seeing another part of the world right at this moment—someone waiting, someone dying, someone laughing, someone eating. The idea of possible worlds was posited by Leibniz as a way of explaining the existence of evil. He insisted that the actual world is the "best of all possible worlds," a claim famously mocked in Voltaire's Candide. Modal logic uses the idea of possible worlds to evaluate the necessity, possibility, contingency, or impossibility of propositions. Many physicists theorize the actual existence of these possible worlds: the cosmological notion of the multiverse postulates that there are in fact other universes where other versions of our own selves are waiting, dying, laughing, eating in slightly different or exactly similar ways. An interpretation of quantum theory allows for a similar possibility, that all possible pasts, presents, and futures are in fact real. In his masterpiece Being and Time, Heidegger makes the distinction between an object being ready-to-hand, that is in the flow of Being, and something being present-at-hand, taken out of "Being" and into the realm of "beings", things, objects. For example, our hands themselves are almost always ready-to-hand, that is, we don't think about them, they just are in the “flow” of doing what they do—grasping, releasing, holding. Our hands are proximally close to us but phenomenologically furthest away. When we pick up our cup of coffee, type on our keyboard, hold our child's hand, or swat away a mosquito, we are not thinking about our hand, the hand is in Being, part of a continuous activity, connected seamlessly to the other objects in its environment. However, when we stop to look at our hand, when we inspect it and think about the muscles, bones, and nerves that make it up, when we try to consciously feel our hand against another hand, our hand becomes "present-at-hand." Our hand is taken out of Being and becomes a "being," a thing, an object. The phenomenon of something being present-at-hand usually happens when the object breaks. We are hammering a nail. In this act, the hammer does not exist simply as a hammer, but part of an environment and a use that is connected with our own hand and arm, the nail, the wood, the construction project on which we are working. The hammer breaks: suddenly, the hammer becomes present-at-hand. It is taken out of this continuity and is shown in it discontinuity as object, as "hammer." We smash our thumb. Our thumb, which we have not considered for months, suddenly comes to the foreground as the most important object on our body, in some ways separate from the continuity of our body as this suffering "Ouch!" It is uncanny to see our bodies, which for the most part remain unnoticed, “ready-to-hand,” as objects, as “present-at-hand,” because in experiencing our bodies as objects, we are experiencing that part of us that is dependent, finite, that part of us that will eventually die. Part of the anxiety of a medical check up is the foregrounding of our bodies not as free subjects, but as observable objects, living corpses. Part of the sickness of being obsess with looks is that we turn our living bodies into dead things to be, like a corpse, scrutinized, made-up, surgically altered. During the one o’clock hour, there is a scene where Glenn Close inspects the skin on her wrist (near her watch)—she frets about age. Her partner reassures her, “It’s skin. It’s supposed to bunch up.” She replies, “But it’s the way it bunches.” The anxiety of seeing our own decay, our own non-being—do we flee this fact or do we face it resolutely? A similar analysis can be made of time. When we are "in" time, caught up in its continuity, we experience it very differently depending on the activity that is occurring. Time with a lover is not time with a bore. Time anticipating something desirous is not the same time waiting for something that is dreadful. Like a complex origami crane, Time often folds in on itself in paradoxical ways, a shorter time being experienced as longer ("That was last week? It seemed like a month ago!") and longer times being experienced as shorter ("It seems like your last birthday was just yesterday!"). It is uncanny to really stop and think about time, to make time "present-at-hand." Augustine says, "What then is time? If no one asks me, I know: if I wish to explain it to one that asks, I know not." The main conclusion of Heidegger’s work is that being is time. Not the space-time continuum of the physicists, but the existential continuum of an “I” (Dasein) thrown into existence, pulled by its past, and projecting into its future. Watching The Clock precisely engenders this experience where time is not conceived as simply “now-points” on a linear continuum, but is stretched between past and future, a past that provides the ground for making meaning of the present and a future that we do not merely wait for but anxiously anticipate. Time is something we must live. In anticipating the next frame, we have something like the experience of anticipating our own life’s “next frame,” which will ultimately end in the final frame of our own death. Precisely by using so many images of the “everyday,” Marclay uncovers the “truth” of the everyday, that it is mostly an inauthentic veil that covers over the fact of our freedom, our life, our death. Through watching “The Clock,” we gain some insight into what it means to resolutely “be” towards death, not fleeing death by rushing into the everyday hustle-bustle of existence, an existence which is obsessed with checking “the time,” but by authentically facing our own Being, our own Time, and in this way, the truth of our own selves as unique, alive, and free. We are unavoidably caught up in Being and Time, “stretched along” between birth and death, thrown into our possibilities. Despite the possible fact of these other worlds, these other times, it the actuality of this world, this time that we are living. It is this clock that ticks, our clock. “The Clock” throws us back onto our own clocks, our own time, which is to say our own life and death. “And therefore never send to know for whom the bell tolls; It tolls for thee.” “The Clock” ticks, tocks, and tolls for we. It is a knell that not only announces our march towards death, but our journey through life. The clock watches us just as much as we watch it, reminding us not only of our finitude and dependence, but our possibilities and our independence. The clock reminds us of the inevitability of our demise, but also the fact that we are free. Do we watch the clock as a way of looking away from Time? Or when we look at time, do we uncover the truth of our own existence? The question then become not that we watch the clock, but how we watch “The Clock”? Thumbnail image is from here.